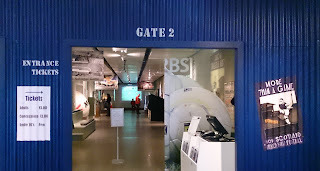 There are two opportunities at present to look at the history of football in exhibitions in Glasgow. 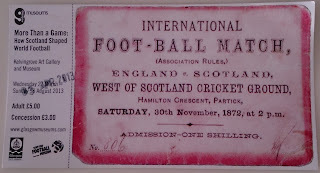 Firstly there is the Scottish Football Museum which has had a space in Hampden Park ever since the stadium was redeveloped. 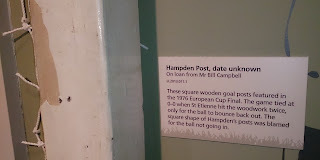 Alternatively, at Kelvingrove Art Gallery until 18th Aug 2013 is an exhibition entitled "More Than a Game: How Scotland Shaped World Football". 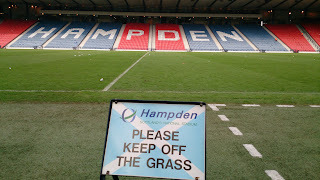 Firstly I went with my children to the Hampden Museum, as we hadn't been for ages. 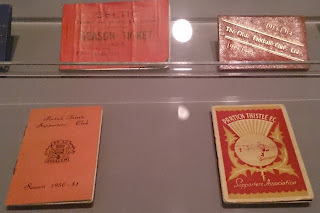 It's £10 to see the museum and get the stadium tour, but children with Glasgow Kids' Cards are free (£5 otherwise). In the years that have passed since we were last there not a lot has changed. 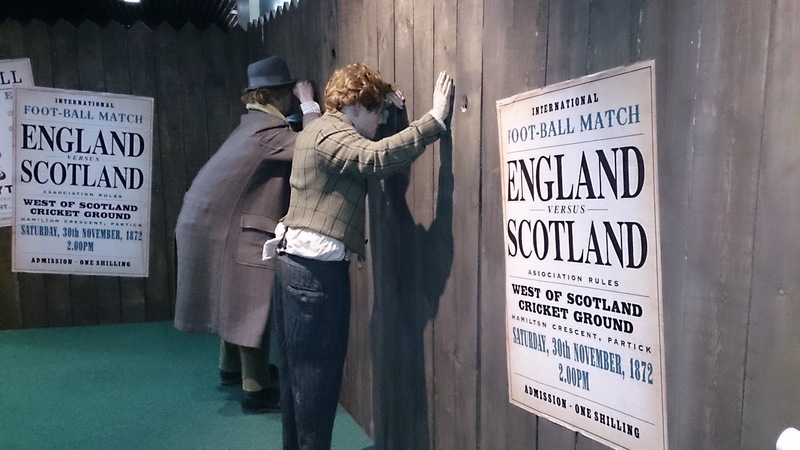 It starts off with a chronological look at the development of the game in Scotland, from the world's oldest international match between Scotland and England, played in Partick in 1872, to the foundation of the football league and it's development over the years. There are lots of nods to Scotland international teams, as is appropriate at the national stadium, particularly those that got to World Cup finals, with a model and video of Archie Gemmill's goal against the Netherlands, looking like something from a bygone era nowadays. It makes this solitary goal into a bit of a religious relic which is probably overstating its importance on the world stage. I think the film Trainspotting captured the moment more relevantly. Much like Scotland reaching the World Cup, other things on show needed explained to my children as being before their time and entirely alien. For example, why exactly were there rows of "Inva-cars" along the touchline at most matches in the 70s? There is an awful lot on Rangers and Celtic here: photos of Terry Butcher, Ally McCoist's golden boot, Neil Lennon's shirt and various paintings of Celtic players. The "Hall of Fame" has a preponderance of Old Firm players too. Bertie Auld and Maurice Johnston were the only ones I spotted with a Partick Thistle link on my quick glance at the list, but then again I'm guessing it was their Rangers/ Celtic connections that got them listed here too, no? 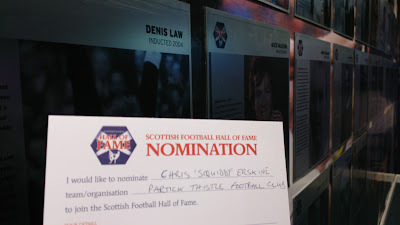 So we filled in a card to nominate a current Partick Thistle legend for this honour. 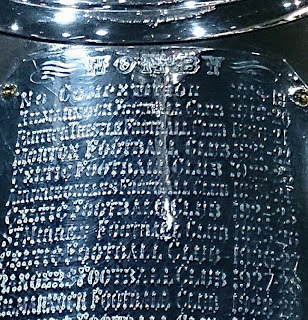 On looking at the Scottish Cup trophy, which is on permanent display here, I took what I saw on it as a good omen for the end of this season. I'd like to see the First Division League table at the end of the 2012-13 season looking something like this, with Partick Thistle just one place above Morton. 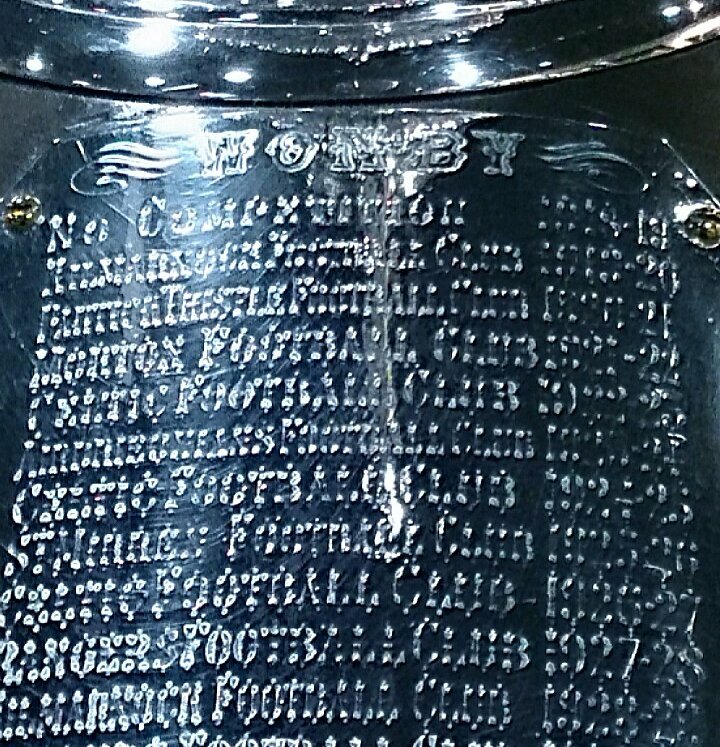 (If the picture isn't clear it says "Won by... No competition...Kilmarnock...Partick Thistle 1920-21...Morton 1921-22...Celtic...". In fact these were the first and last years that Partick Thistle and Morton have won the Scottish Cup). Next up was the stadium tour. Considering that our group consisted of us being the only Glaswegians (and Partick Thistle fans to boot) plus families from Fraserburgh, Mauchline and Falkirk it was again depressingly centred on tales of Rangers and Celtic: which end they get for finals, which dressing rooms, which side of the tunnel they stand on. 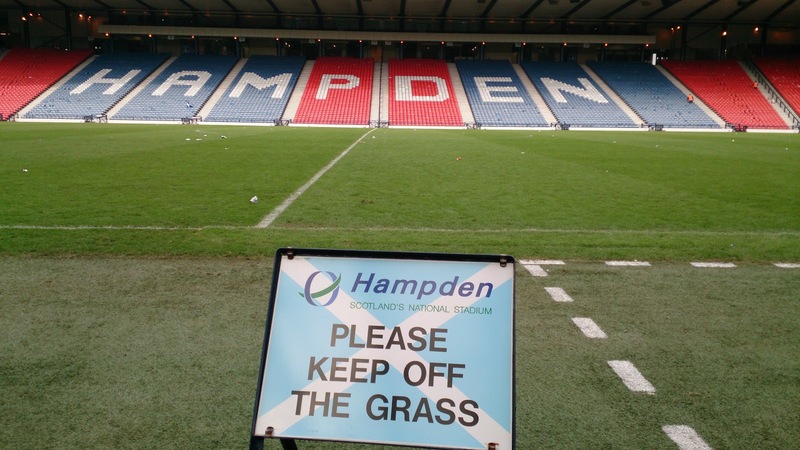 Please, Rangers and Celtic are not all that there is to Scottish football, and in fact most of the time they seem to be playing here against their will. The ground itself is the property of Queens Park Football Club of course of whom we heard precious little, and the tour guide's talk was out-dated by the fact that the old firm teams are 3 leagues apart at present and Rangers will only be visiting Hampden on league business for a while yet. The tour itself is good though and was the favourite part of the visit for my children. You get into the referees' rooms and the dressing rooms, which to be honest were a wee bit wiffy from the Scotland and Wales teams occupying them 48 hours earlier. 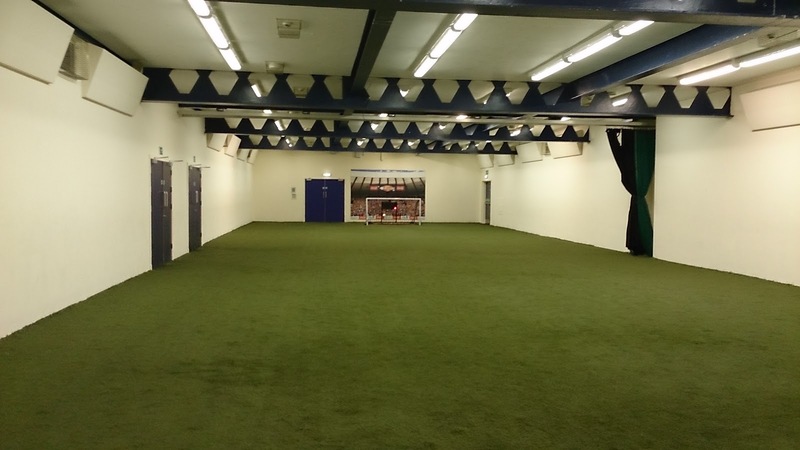 The astroturf indoor warm-up area allows everyone to have a quick kickabout. Then you get to walk out through the tunnel onto the pitch and pretend you are being greeted by the Hampden roar. A good time was had by all. 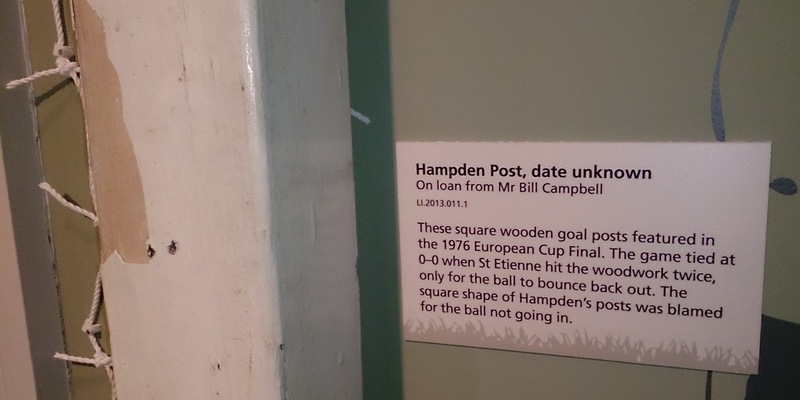 As the exhibition on at Kelvingrove is being organised by the Scottish Football Museum I wasn't sure if there was just going to be a lot of duplication. However from the leaflet promoting it it is clear that promisingly it aims to have a broader reach than just the Old Firm. There are talks running alongside it on topics such as women's football, the world's first black international footballer (Scotland's captain in 1881, Andrew Watson), Third Lanark, Queen's Park and from a Mr Robert Reid at Woodside Library on the 8th of June "The Story of Partick Thistle Football Club". 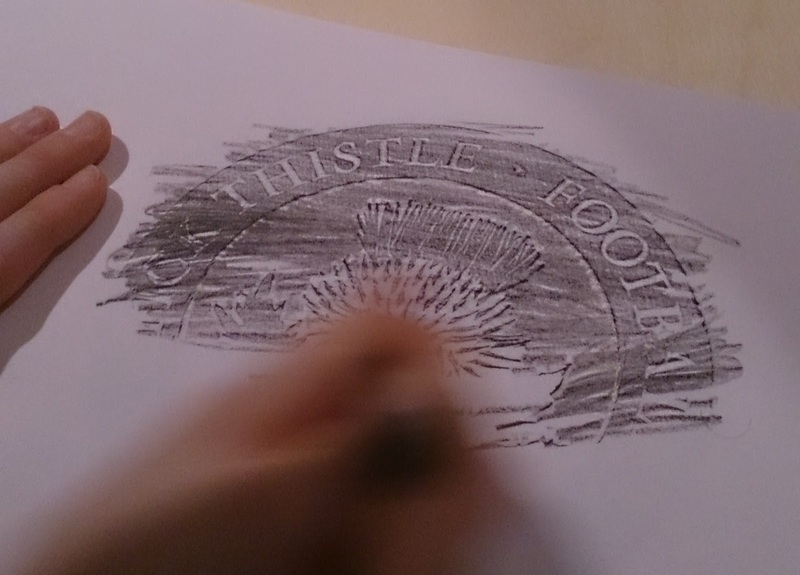 Like all the visiting exhibitions at Kelvingrove there is an entry fee of £5, but children under 16 are free. The normal Kelvingrove organ recitals were meant to have a footballing slant with such classics as "Ally's Tartan Army" being performed, but at the time of writing a "technical issue" means that this isn't happening yet (I think it's just that technically this isn't actually music). 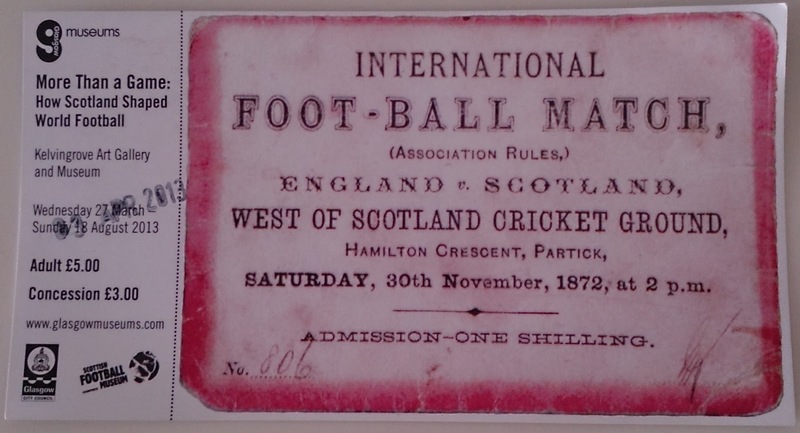 A nice touch was the entry ticket being a reproduction of the tickets for the world's first "International Foot-Ball Match" in 1872 at the West of Scotland Cricket Ground in Partick. 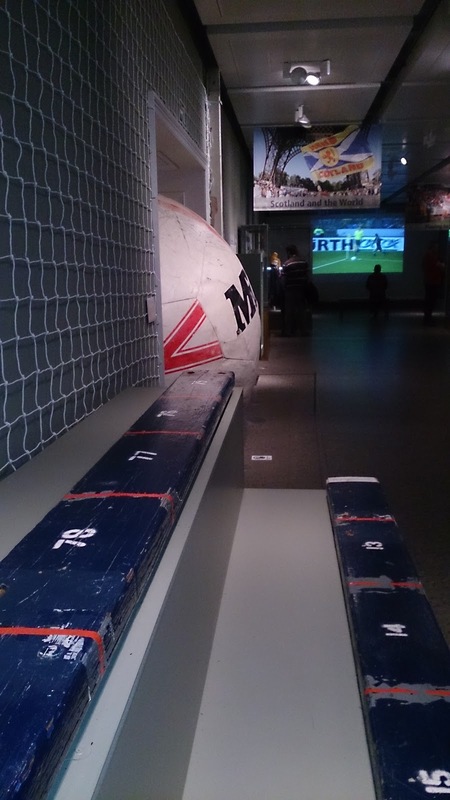 The exhibition itself is far more engaging than the one at Hampden and does make a better connection with the social history of football clubs' origins, particularly in the parts around the Third Lanark army regiment or the leather workers in Partick making 20 Tomlinson T-panel footballs a week. Also the early history of football in Scotland, including a leather football from the 1540s and early records of women's football are good. 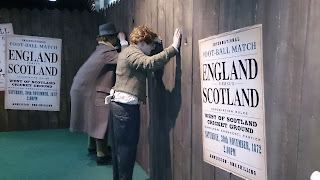 Although the exhibition is titled "How Scotland Shaped World Football" this doesn't really feature prominently in the exhibits, but a touchscreen tells the stories of Scots immigrants bringing football to all the corners of the Empire and beyond. A lot of this is expanded upon in the interesting wee guide booklet. I quite liked seeing the square wooden goalposts taken from Hampden which St Etienne fans blame for their not winning the 1976 European Cup Final due to their shape. Otherwise the football parts are more predictable, but interesting none the less with films on the Real Madrid cup final at Hampden, the Busby Babes and various old Scottish international matches. 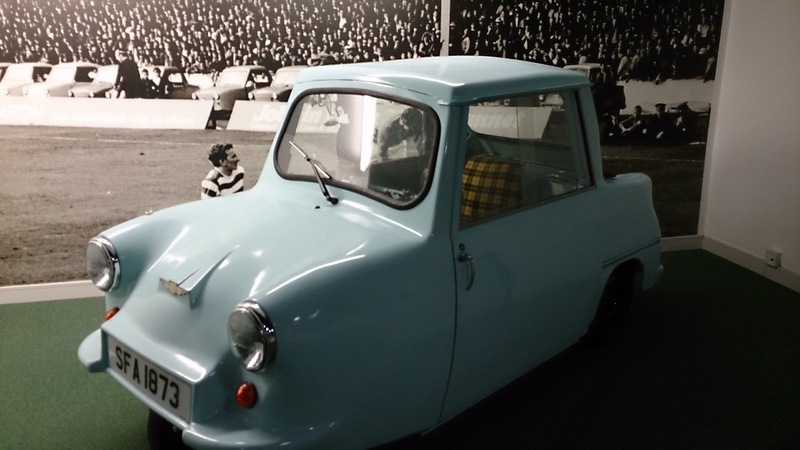 Also the paean to great Scottish managers doesn't have any surprises, but what is glossed over is that Scotland once lead the way in many areas of football development, but we have now been left behind looking at museum exhibits of our former glories. 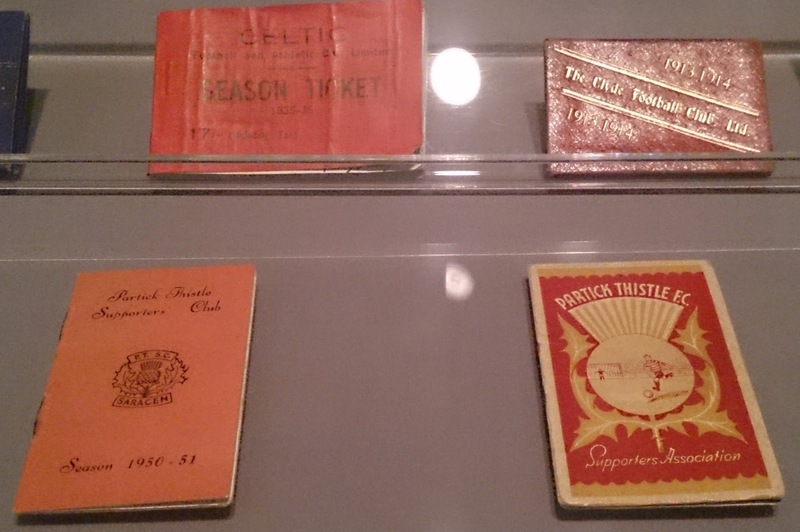 As a Partick Thistle fan I cannot stop myself looking out for any references to my team, and much as at Hampden (where a copy of the old fanzine "Sick In The Basin" is on show) here it was just in relation to our supporters with a couple on supporters club membership books on display. My children were kept engaged throughout this exhibition with video touchscreens challenging you to be the referee, a virtual football video game projected on the floor, dressing up boxes and a brass rubbing bit with club badges.